Caterpillars (larvae) hatch from eggs laid the previous year in early spring at about the same time new leaves begin to emerge and feed on the young tender leaves. They are partial to Aspen and Cottonwood but are just as devastating to many deciduous trees commonly used in the landscapes of northern New Mexico. They form small webs or “Tents” which expand as the larvae grow. They leave the tent to eat but return to it for refuge at night or during inclement weather. Large areas of trees can be defoliated which weakens the tree by restricting its ability to photosynthesize due to fewer leaves. In rare situations, a young tree is defoliated beyond it’s ability to recover, particularly if the tree has been stressed by other environmental conditions or if they are newly transplanted and do not yet have enough food reserves in their root system to sustain the tree during severe defoliation. Adult tent caterpillars are brown or yellowish moths with a darker colored band across the front wings and are often seen congregating around lights. 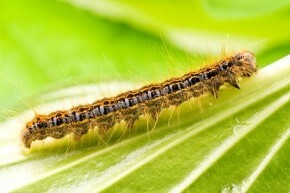 Tent caterpillars can be controlled by spraying your trees with various insecticides. Sevin insecticide’s active ingredient in Sevin is carbaryl which is a very safe insecticide often use in flea and tick power used on pets. Payne’s also recommends using organic products such as Thuricide which is a liquid formulation of bacteria. It controls caterpillars, loopers, cabbageworms, hornworms, leaf folders and leaf rollers. Or Spinosad which is derived from the fermentation juices of a lowly soil bacterium called Saccharopolyspora spinosa. All of these products can be purchased at both Payne’s locations.